In 2013 Krista Martin, Owner of metro FOR MEN, created a collection of looks for men’s hair trend in 2013. She began her career in cosmetology in 1988 and new right from the start this was for her. In beauty school Krista was encouraged to display her talents in haircutting by entering competitions. In her first haircutting competition, she won 1st Place. While competitive work was never a focus for her, it was still rewarding to be recognized for her dedication to master haircutting. As her career progressed, Krista decided to focus on learning and perfecting her craft. Now at more than 25 years behind the chair (15 of them focused on men\’s grooming and styling), today she feels she is doing the best work she has ever done. In 2013, Kriista put her skills to the test by coming up with a men’s hair collection of current men’s hair trends. In January of this year, Krista hired a well known photographer named Babak to document her take on retro rock hairstyles for men. In this photo shoot she recreated looks from the 1950s 60s 70s 80s and 90s. “It was a fun experienced where I learned a lot about putting a men’s hair trend collection together as well as being involved in a photo shoot”, Krista explained. The photo shoot began first thing in the morning at 9:00 a.m. and put all my looks together by 2:00 p.m. Krista then headed for the photography studio where the hard work began. The entire day ended at 9:00 p.m. and Krista was exhausted. 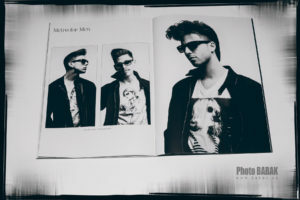 Not only did she pull together her idea of the “Rock of Ages” men\’s hairstyling theme, but created another look per model for a more current men’s haircut portfolio. That was a great idea and those haircuts were recognized and published in Hair World International. “It is a great feeling to be recognized in the men’s haircutting and hairstyling market especially after all the dedication I’ve put into my career”. 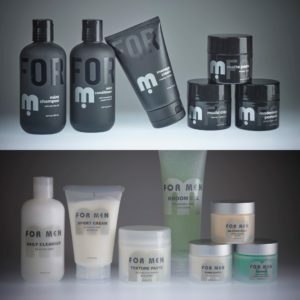 Check out Krista and her work at m FOR MEN Salon|Spa in Lake Forest, CA.